Lives and works in Newton, Connecticut. BA in Fine Arts from Wesleyan University with a year spent at the Tyler School of Art in Rome. 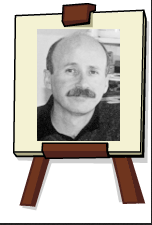 Briefly lived in NYC with his wife while illustrating for various publications including the New York Times, Boston Globe, and Harvard Business Review. Inspired by the birth of his first child, Meisel began illustrating and creating children's literature, which has been his passion ever since. Meisel's book, See Me Run, landed on the Geisel Honors List in 2006. Paul uses a mixed media approach when illustrating his books. He uses watercolor and pen and ink and often combines them with gouache. His pictures "...have a friendly charm...". He has illustrated more than 65 books, many of which he has authored. -Students/children of all races and ethnicities are repeated throughout the book. - Pictures are placed in varying heights on the page. -Book showcases varying colors of skin and differing appearances. - Many pictures show perspective in relation to location and space. - When the picture is showing unity, the color bleeds to the edge of the page, when the picture is showing individuality, the pictures are separated by edges and differing events happening in the picture. - The book rhymes which leads to a flowing, musical feel, which helps with prosody. - Colors are vibrant and the pictures are made to look like painting. Meisel's illustrations, while being very concrete in nature, use many of the same techniques that Klee used in his paintings. The whimsical nature of Meisel's work can also be compared to Klee's work. Maybe if Klee had been asked, he would have illustrated a children's book. Below is a video clip of someone using gouache and watercolor together. 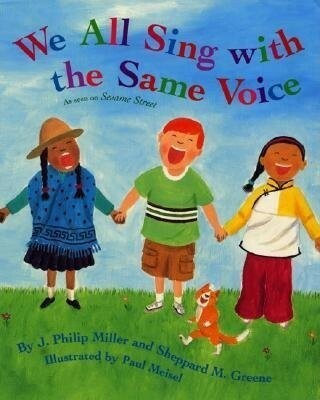 "We All Sing with the Same Voice"
Originated on the popular children's show, "Sesame Street." C. Create a caring community. 1. Consider it a high priority to foster caring attachments between fellow students, staff, and the community. K-2 c. Identify relationships in their family, school, and community that are caring. responsibilities, and short-term and long-term goals. CCSS.Math.Content.2.MD.D.10: Draw a picture graph and a bar graph (with single-unit scale) to represent a data set with up to four categories. Solve simple put-together, take-apart, and compare problems1 using information presented in a bar graph. Social Studies: The teacher could talk about emotions and how they are present in the book. Listening Standard 1: Learners will participate effectively as listeners in formal and informal groups. Benchmark: The student remembers and applies the content of the message. Using our overarching standard (listed above) they could talk about the presence of different cultures, like the way they are dressed. Locations and countries could also be incorporated using social studies standards. The students will create their own lyrics to We All Sing With The Same Voice, making sure to consider the melody and beat. Benchmark 2: The student sings expressively, with appropriate dynamics, phrasing, and interpretation. to communicate an interpretation of a given song. The students will all stand in a circle and each individually sing the song that they created. While the student is singing, if a part of their song applies to another student, that student will jump up and down three times. For example, if I was to sing “I have brown hair” all of the students with brown hair should jump up and down three times. The student will analyze the influence of culture, media, technology, and other factors on health. The student will describe how culture, media, technology, and other factors influence health behavior as related to the ten content areas contained in standard one. The student will demonstrate the ability to use interpersonal communication skills to enhance health. The student will demonstrate verbal and nonverbal communication skills to enhance health. List the ways that the 7 Habits are included in the project. My thought is to show how the children will gain new skills and understanding from experiencing the 7 Habits. 1. The students will need to be responsible for taking the initiative to get to know their fellow peers. For example, the teacher will facilitate student interaction through student of the day or week. 2. The students will need to know and understand that different cultures have different value systems and they are all valid. For example, this book represents different family structures. 3. The students will clearly articulate the goal of each activity in respect to other students and themselves. For example, during group discussions students know they are expected to actively participate in the discussion. 4. The students will respect that other students have different opinions than their own, and will be open to change. For example, a think pair share activity would facilitate an open discussion. 5. The students will be able to actively listen to each other's opinions. For example, the teacher will work with the students on their listening skills. 6. The students will be able to actively work together outside of traditional assignments. For example, the students will create a song/dance using the book's melody and concept. 7. The students will be open to change their goals throughout the year as needed. 8. The teacher will have a compliment box or bulletin board available for others outside of the classroom to see.